Assisting Michigan educators with their student career preparation management needs! Educators, I've spent thirty-five years in education in the State of Michigan with the last thirteen of those years in career preparation and placement. During my time working with students with career shadows, co-op (cooperative education), and work study programs, I've developed numerous documents*, forms*, and systems* to insure quality, promote uniformity, and reduce work time. These forms have proven to be time savers and effective tools for recording and managing student data. Several districts and counties within Michigan have also found these documents and files to help aid them in the implementation of their programs and I would welcome you taking some of your time to review these files. Because I feel so strongly about the effectiveness of these documents, I would like to offer them to you "free of charge" for use in your district or county. I only ask that you give credit to me for the development of these. Listed below are images and descriptions of the numerous files and documents. Feel free to click on the images for a larger view or download the file for your use. All of the documents identified below merge with the spreadsheet system which maintains unique data, specific to each student's printed document. The spreadsheet system is the key to the whole program and recently rewritten to reduce keystrokes by the coordinator and to encompass all programs (CTE, School-to-Work, Work Study and Community Based Instruction (CBI) programs). I would also be willing to provide a few services to you for a nominal cost should you choose to take advantage of them. These services include training on the use of these forms, an "On-line Evaluation Form" that you can use with employers who prefer to use technology when completing Student Evaluations and other tasks for you, and on-line student Hour reporting forms. Click on the Career Placement Program Services link identified on the main page to review each of these services (program training, on-line evaluation, on-line hour reporting forms, etc.). There is no need to utilize these services to use the forms and spreadsheet. *These files, forms, documents, and spreadsheets were all created using Microsoft products. This document merges with the Employment Data worksheet (see Employment & Data Record below) to compile a concise training agreement & plan that meets all of the State of Michigan Pupil Accounting requirements. There are three different training agreement options available for you to select. 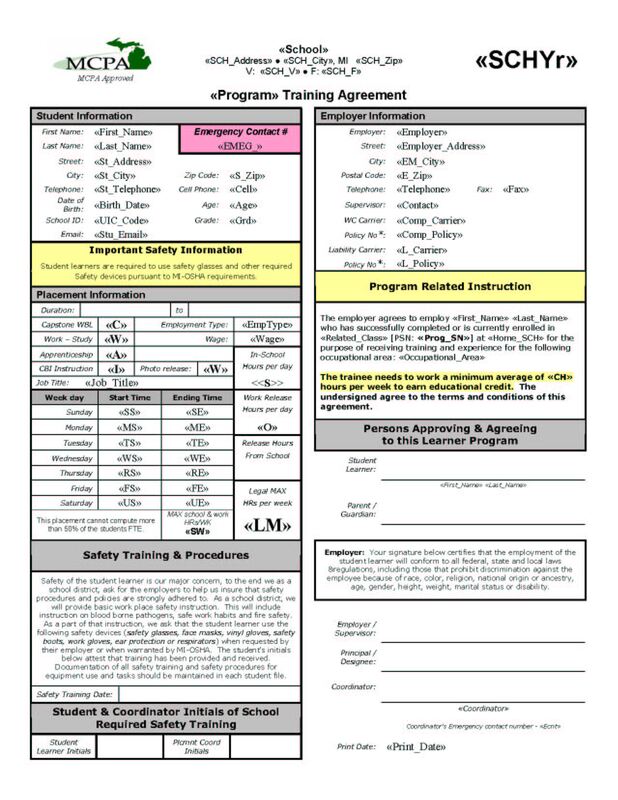 Option One is a concise three page document which is a training agreement and training plan that meets all the State's current requirements. Option Two is exactly the same as Option One except that it includes a signature area for your high school counselor to sign approving the placement and meeting graduation requirements. Option Three contains all of the features of Option One & Two, but is much more complete and creates a 16 page document that includes numerous extra documents from a letter to the parents to a visitation record and safety inspection sheet. Each of these options are created using the same Employment & Data System (spreadsheet), but based on the responses or selections you make create either a CTE, General Ed Work Study/School-to-Work, or special needs Community Based Instruction (CBI) unique to each student you place. All of these options are free for your use and are editable to meet your needs. Not all fields are required for use, but will provide a much more complete document. 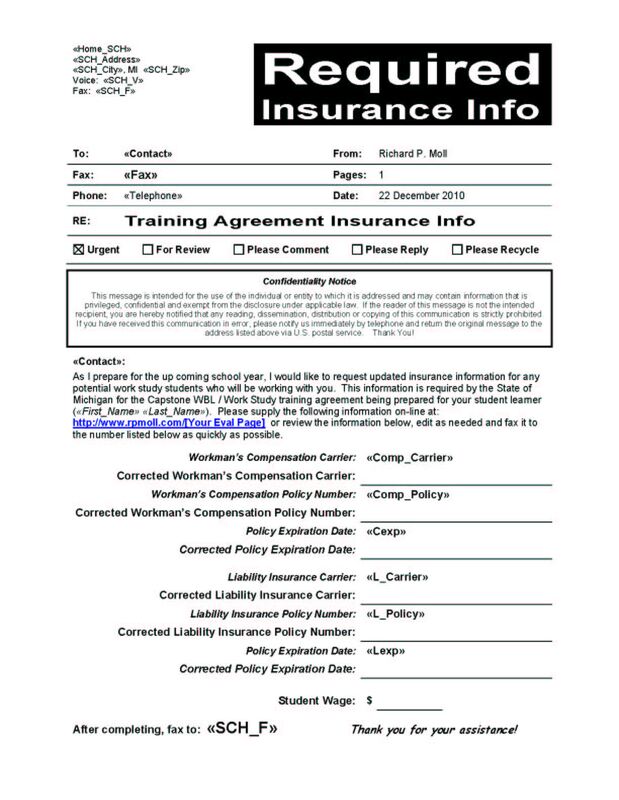 This document merges with the Employment Data worksheet to create a fax which can be sent to a prospective employer to collect the required insurance information necessary for a State approved training agreement. 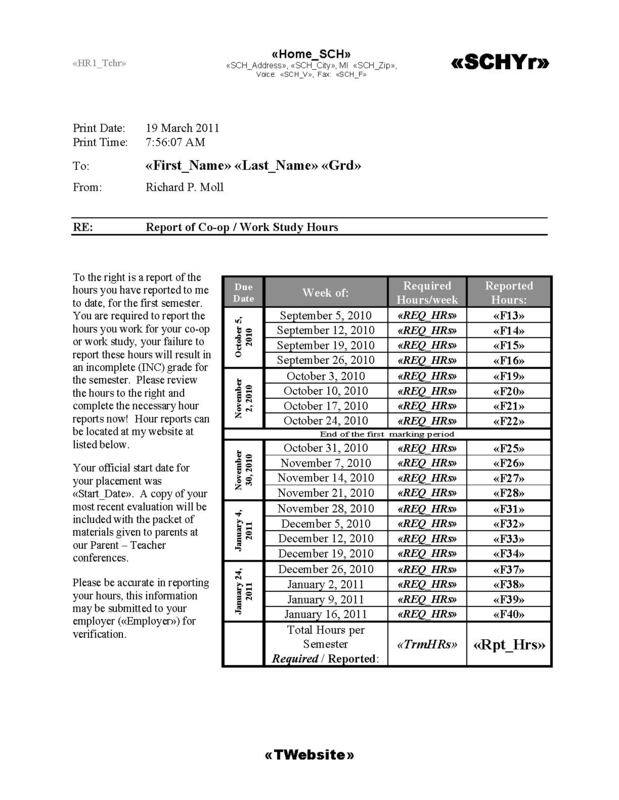 This document merges with the Employment Data worksheet to create a letter to the student and their parent. Included with this letter is a copy of the signed training agreement. These two forms are used to verify the hours that the student has reported to the placement specialist, coordinator, etc. After printing, these reports are distributed to the student via one of the student's classroom teachers identified in the spreadsheet. These reports will need to be edited once per year to ensure that the dates that information is reported for is accurate. 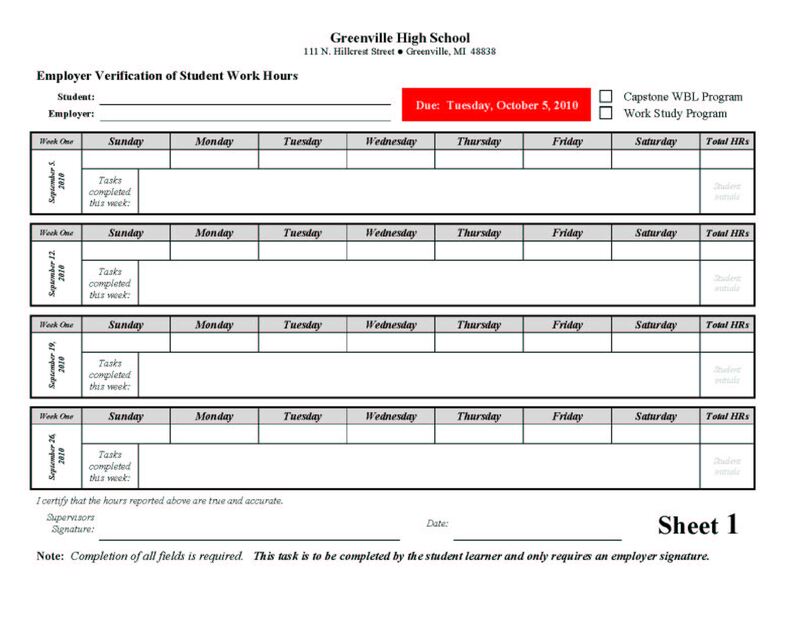 These forms are used by the student to report the hours that they have worked to the placement specialist, coordinator, etc. These reports are the responsibility of the student and not the employer or placement specialist, coordinator, etc. The document provided here is just one page of numerous pages. 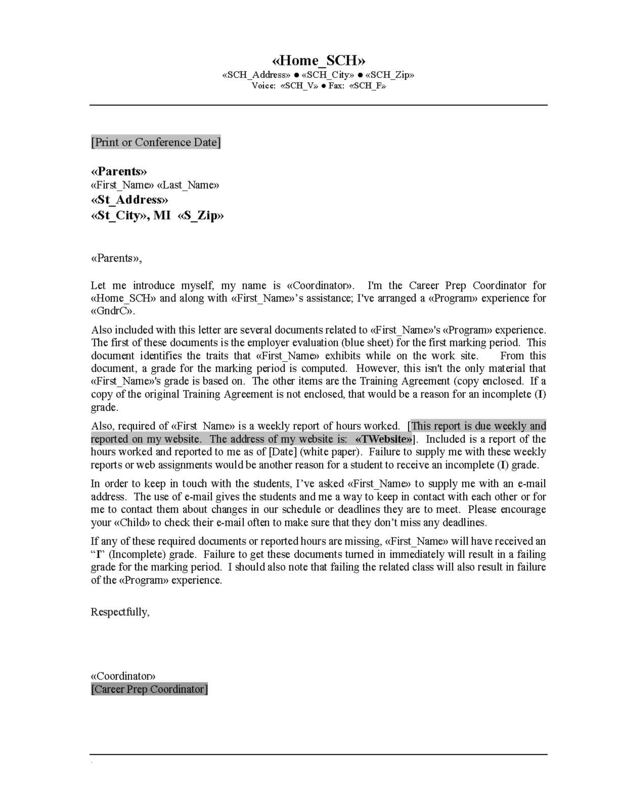 As the coordinator, you will need to duplicate the page and edit to meet your specific requirements. This document greets the employer and outlines the tasks that they are to complete to evaluate each student working with them. 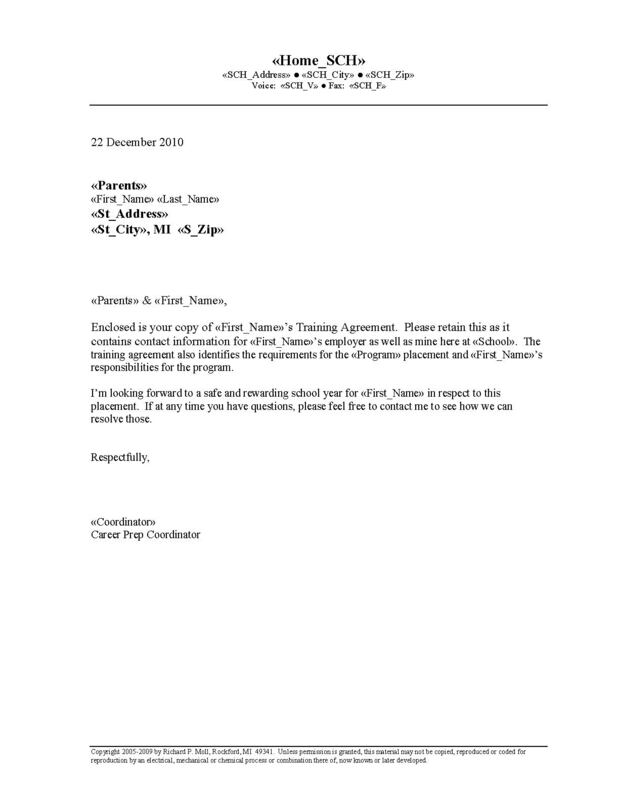 This document is combined with the Employer Grading Form (see below). These two evaluation forms are used by the employer to report the student learners progress at the work site. There are two forms, one for each marking period. Should you be on a trimester school year, you could just repeat using Form One. This letter is printed and placed in an envelope with the student PTC Student Hour Report for parents to pick-up at Parent/Teacher conferences. If the parent doesn't attend the the letter and documents are stamped and mailed via the USPS. 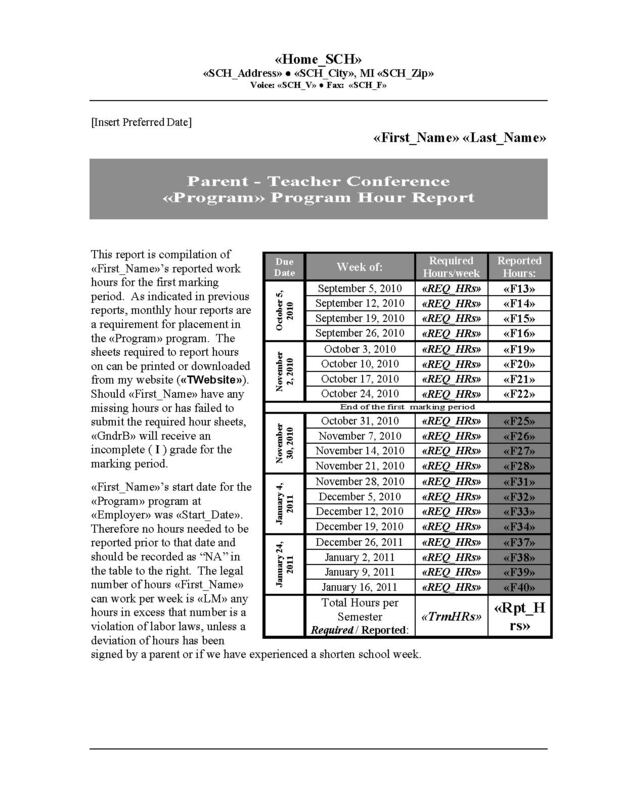 This document is similar to the Student Hour Reporting Form which identifies all the hours that the student has reported up to the Parent/Teacher conferences. This series of worksheets are the key to the entire system which creates all the training agreements, plans, letters, and forms that have been outlined above. In most cases, these agreements, letters, and forms can be produced with just a few keystrokes and personalize unique documents for each student selected. Some of the new features of this workbook system include the option to include every student enrolled in your center or school to be included in the workbook and by selecting their UIC code, all their personal information is automatically pasted into the appropriate worksheet. All of the employer information is pasted the same way once it has been input in the workbook. The workbook can maintain data on 1800 students, 250 businesses, and 200 student placements. 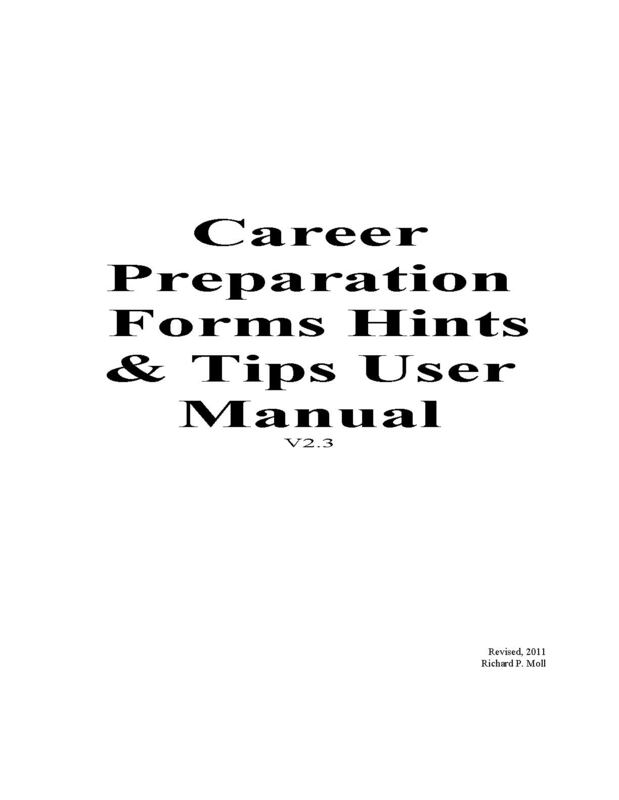 This set of worksheets have the current State of Michigan task lists for each career area of each Career Pathway listed in a drop-down list for your to select by clicking on that task. This feature is replicated 9 times to provide each student with up to 10 tasks for their placement. This same set of worksheets are applicable for both paid and unpaid student placements. Based on your selection of the placement type, the non-CTE student has an area that it allows you, the placement specialist, the opportunity to manually list the tasks the student will complete from either past experience with the work site or by using tasks identified for that career field from the "onet" website (www.onetonline.org). These workbook series and related forms have been used successfully by a number of districts within the State of Michigan for a number of years and have proved to be a beneficial addition to their program; but I'll let you be the judge of that. This manual is designed to give the novice user sufficient information and direction to complete all the tasks necessary to create a complete training agreement and plan. For those of you that may be more proficient user of MS Excel, please bear with me as I provide direction, hints, and tips for the use of the spreadsheet and merge documents. Should you find yourself stumped at some point and the directions provided within this manual are to confusing, please feel free to contact me. I'll be more than happy to help you resolve the problem and get you up and running.